Visit Midtown Manhattan's Eye Doctors & Eye Clinic of Choice! Midtown Manhattan Eye Care At Its Finest! Sight Improvement Center is a dynamic group of optometrists with extraordinary educational and professional credentials. We are passionate about patient care and dedicated to improving quality of life through life-changing vision procedures and treatments. 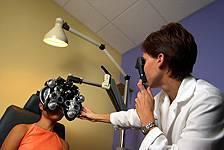 We are also your Low Vision doctor in New York City, offering patients a variety of strategies and equipment to help them live a normal life again. Dr. Charles Hollander graduated with honors in 1980 from the Pennsylvania College of Optometry. Dr. Marlene Jurman is a graduate of the State University of New York College of Optometry. Dr. Bindu Thomas is a graduate of the State University of New York College of Optometry. To learn more about how Sight Improvement Center can meet your eye care needs, we encourage you to schedule an appointment with any of our doctors. Sight Improvement Center receives my highest rating and recommendation for the following reasons: Dr. Hollander is highly knowledgeable and very pleasant and friendly. The on sight optical is also very convenient and have provided me excellent service. I have referred my family and friends and will continue to do so. I have been going to the Sight Improvement Center for 20 years and have always had wonderful experiences here. Everyone that works there is so helpful. Dr. Hollander even helped me get Lasic years ago and my husband find the perfect glasses this week. They work with you to have your insurance cover things and are extremely helpful all around. Dr. Hollander fitted me with a new type of contact lense for people with keratoconus. His lab did excellent job the first time and the contact works perfectly! Dr. Hollander and all his staff are wonderful. Everyone is friendly and genuinely care about their patients. I received a very thorough exam. He took the time to explain options and go over the exam with me. The office wait time was minimal. A smooth and easy experience. I highly recommend him. Dr. Hollander has been my eye doctor for the past ten years and I can not speak highly enough about him or his practice. We met when he made time in his busy schedule for me (as a brand new patient) when my parrot scratched my eye with his beak. Dr. Hollander had me pain free and fixed up in no time. If you’re new in town or just looking for a new eye doctor, you can’t go wrong with Dr. Hollander. Very positive experience with Dr. Hollander and his team. Dr. Hollander is an excellent listener and along with the results of your exam, he cares about how your eyes actually feel to YOU by asking about your concerns (if any). My tests were quite thorough and carried out in a very relaxed environment. The office doesn’t have a cold “medical” feel to it. Will definitely return. I’ve been a patient at Sight Improvement Center for 20 years, and wouldn’t dream of going to anyone else for my vision needs. I’ve seen Dr. Hollander and his team for annual exams, emergency appointments, new glasses, contact refills, and much more - and have never experienced anything less than top-notch service. Every visit comes with a detailed update on my vision, as well as friendly conversation. I recommend Dr. Hollander and all the staff at Sight Improvement Center without reservation. After a comprehensive eye exam, we’ll work together with you in our New York City Eye Care clinic, to figure out the best strategies and low vision equipment for your personal requirements. Our warm, friendly and professional staff will assist in making the proper choice in frame style, shape and size for your family's prescription and visual needs. We offer Bifocal and Multifocal Contact Lenses, Gas Permeable (GP) Contact Lenses, Contact Lenses for the "Hard-to-Fit" Patient, and Toric Contact Lenses for Astigmatism. While most people schedule regular check-ups with doctors and dentists, many are not aware of the importance of an annual visit to the eye doctor. Regular eye exams can be the key to the early detection and treatment of emerging vision problems, eye diseases, and a number of other health issues. 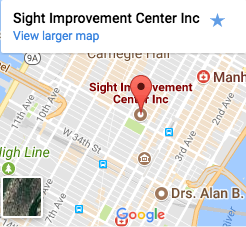 When you come to a Midtown Manhattan optometrist at Sight Improvement Center for an eye exam, you will receive comprehensive service designed to find and correct any vision or eye issue. Don’t take good vision for granted, schedule an appointment today! Conveniently located in Midtown Manhattan on 43rd St. between 5th and 6th Ave.